Porsche 918 Spyder: Best Sounding. Hybrid. EVER. 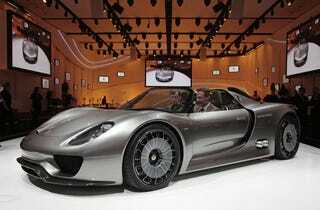 The Porsche 918 Spyder's the sexiest hybrid concept out there, offering Carrera GT-like performance and some high, mostly made-up fuel economy number you stop caring about as soon as you hear the 3.4-liter V8 rumble.